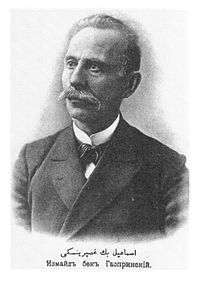 Ismail Gasprinski or Ismail Gaspirali (Turkish: İsmail Gaspıralı) (March 20, 1851 - September 11, 1914) was a Crimean Tatar intellectual, educator, publisher and politician. He was one of the first Muslim intellectuals in the Russian Empire, who realized the need for education and cultural reform and modernization of the Turkic and Islamic communities. His last name comes from the town of Gaspra in Crimea. "Our ignorance is the main reason for our backward condition. We have no access at all to what has been discovered and to what is going on in Europe. We must be able to read in order to overcome our isolation; we must learn European ideas from European sources. We must introduce into our primary and secondary schools subjects that will permit our pupils to have such access". Ismail also initiated a new journal for women, Alem-i Nisvan (World of Women), edited by his daughter Şefiqa, as well as a publication for children, Alem-i Subyan (World of Children). Ismail was one of the founders of Union of Muslims (İttifaq-i Müslimin), created in 1907 and uniting members of intelligentsia from various Muslim Turkic peoples of the Russian Empire. He was also one of the main organizers of first All-Russian Muslim congresses, aimed at introducing social and religious reforms among the Muslim peoples of Russia. He also inspired the movement known as Jadidism. 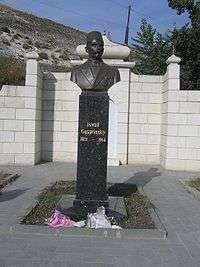 Essays on life and activity of İsmail Gaspıralı Presented by the International Committee for Crimea, Washington, D.C.
Wikimedia Commons has media related to Ismail Gasprinski.